When connected via WIFI or an ad hoc wireless connection to your Windows PC or Mac, you can control your desktop using Doceri on the iPad and Doceri Desktop for your computer. Launch, open, edit, save – you now have full control of your computer just like sitting behind the keyboard. Doceri Remote's desktop viewer continually displays an exact copy of your computer's screen – even Flash-based content. 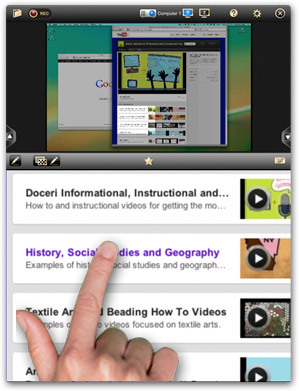 Since the computer image is typically much larger than the iPad screen, Doceri lets you use standard pinch gestures to zoom and pan across your computer's screen so that you can work comfortably at any resolution. 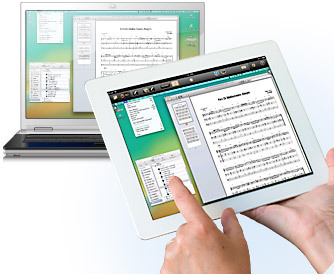 With the iPad's revolutionary multi-touch interface, you can simulate the mouse functions of your computer. Tapping on the iPad screen will move the mouse to that location and click it. Hold your finger down and mouse magnifier appears allowing you to use another finger to make left and right mouse click actions. 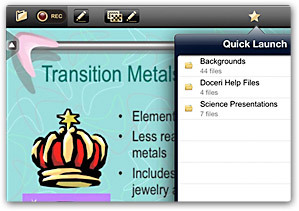 Doceri's QuickLaunch folder makes it easy to open up any document, so you can present and annotate over Powerpoint or Keynote presentation slides – or any file resident on your computer. Anything that you can do on your computer, you can now do remotely through your iPad PLUS you can take your presentation to the next level with live annotations.